To the ancient Greeks, she was Rhea or Gaea. Perceiving the earth as our primordial teacher, they described her as a great vibrant being, a living breathing body, a heart, a spirit, a soul, a Goddess. The Northern European named her Erda, Earth, Ertha, Utha, Herth and Edda and the Romans named her Terra Firma. 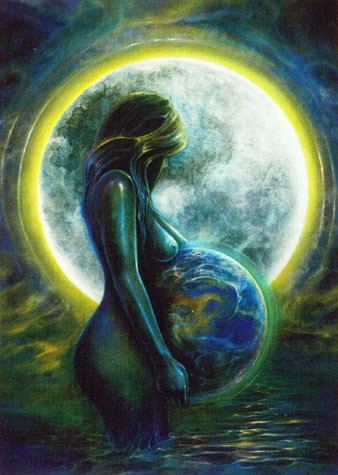 This bountiful Earth Mother and Universal Life-Giver was worshipped by all original cultures. Revered as the mother of every race, every tribe, all of nature, she was loved as the source of creativity and inspiration. Worship of this Great Mother bestowed a profound sense of inner connectedness to all life forms. Bequeathing all riches, Gaia relates to comfort, compassion, support, abundance, generosity, opulence and overflowing fertility. The ancient roots of the word “earth” are embodied within the words, humus and humility. The material realm was once the domain of the Earth Mother, for “material” once meant Mater Earth, or Wealth of the Mother. The frantic pace of modern civilisation has strayed so far from the original energetic meanings of these words. Through living within the knowledge that we are one with nature, we unite with the infinitely tender and nurturing power of Gaia. This entry was posted in Goddess, Women's Sexual Health.